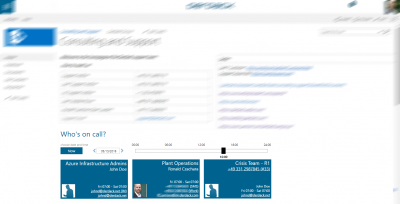 One great feature of Enterprise Alert is the “who is on-call” dashboard. On that page every user of Enterprise Alert can see who the current on-call person is for each team. Wouldn’t it be great to have this “who is on-call” information available in SharePoint or other intranet (or even Internet) sites without the need to logon into Enterprise Alert? On-call persons may have to involve on-call analysts from peer teams in order to troubleshoot problems jointly. It may even be the case that an on-call engineer from windows systems team is alerted but the root cause of the incident may be related to a network problem. In this case the network systems on-call person has to be contacted by the windows systems on-call engineer. A central operations center may want to follow up with the current on-call person from a team in case they have not acknowledged particular alerts in time. In general you may want to provide people in your company access to this dashboard who have nothing else to do with Enterprise Alert at all without the need to be logged on. Execute the following SQL statement on the EnterpriseAlert database. You can see there is a property in the EnterpriseAlert database which controls the access to that page. If the database property “WhoIsOnCallPublicAccess” is set to 1, this page does no longer authenticate any access and displays the content straight away. You can also use this page to show who-is-on-call information in other sites, for example in SharePoint. Please note that if you have SSO activated (i.e. use the AD integration) you still have to make sure on IIS level that all corresponding domain users are allowed to access the web page. In this case you have ‘Integrated Windows Authentication’ enabled for the Enterprise Alert application in IIS. All your domain users who should see this page must have read permissions on the web portal directory on the file system of your Enterprise Alert machine.